New book, 70 pages. Doctrine is the lifeblood of military forces and provides them with the foundation to conduct successful operations. The veracity of any doctrine is completely dependent on it being relevant to current and future operations - essentially by its very nature doctrine is dynamic. National security perceptions and definitions have evolved in the past few decades and now cover an enlarged envelope of imperatives and interests. As a result the military forces of nation-states have had to increase the spectrum of their capabilities to cover a spread that encompasses humanitarian assistance on the one end to high-end warfighting on the other. The military forces have achieved national objectives so far by relying very heavily on their inherent flexibility. 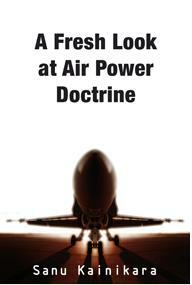 This monograph, A Fresh Look at Air Power Doctrine, evaluates the development of military doctrine - with a detailed analysis of air power doctrine - and its relationship to national security doctrine at the grand strategic level. It argues that, in order to remain relevant, there is now a perceived need to revisit the basics of doctrine and its development process in order to refine them to reflect the contemporary realities of military operations that support international security requirements.